When Jesus Christ saves us, He saves us from something. We are saved from sin and the penalty of sin. But we are also saved unto something. We are saved unto the plan of God for our respective lives. We are saved to do the will of God. God has a plan for each and every one of our lives. After we are saved from sin, we should continue to seek God to find HI perfect plan for our respective lives. Once we find it, we should make it our plan. There is more to living holy than living a clean life (i.e. abstaining from and avoiding sin). That is a major part of holy living. However, in addition to that, we must obey God�s individual command for our respective lives. This involves consulting and obeying Him about our vocation, marriage, where to live, etc. This is what it means to have Jesus as our Lord. Sin is a transgression of the command or will of God. When we fail to acknowledge God in all our ways, we sin. We must obey God�s call on our lives in the area of ministry. God manifests His will to us by His anointing. The anointing is that special favor and unction (ability and knowing) given to man by God to do a certain thing. We should be very sensitive to that anointing or unction, because God uses it to teach us how He wants us to be a blessing to others. We should always obey God�s anointing. When we do we are yielding our members as servants of righteousness. Spend Time in His Presence Praying and Praising. When Conscious of Having Failed Him, Confess It. Be baptized in the Holy Ghost. Get totally immersed in the Word of God at a KCM Meeting! 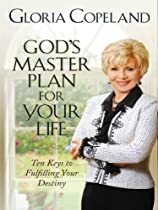 Using personal testimony, miraculous Biblical examples, and a clearly defined plan of action, Gloria Copeland helps readerse find and embrace God's will for their lives.